benzyrnill, 旎宫嘉坊: rains clean, rains moisture the thirsty. Masheng touched me.^read in front yard till it started to drizzle. activated family google apps' waves, &setup. sinful mother sought to sell herself, saying had to help elder brother's grandson for they busy with grain in field now. she left me dishes&left. i saw how she treated my passed dad when he, God, lived a miserable life before he decided to leave the earth. baby's mom, emakingir, posted her first blog, i replied to encourage her activity now in cyberspace. glory of Dad, God, shown me via sins of his relatives.^again upset by the cheap&sanity of my mother's dark soul. the devil, 2 cousins both in the fell&hell of Chinese bureaucracy, visited, trying to connect via my mother, who forever admires power like a rootless weak grass. Holy moisturises thirst.^got holy message&talked to baby son, assured him the coming new game notebook. haunted village front plaza, taught mother&elder brother lesson on self-esteem. chatted with baby's mom, emakingir, online, on her new micro/blogging attempts, inform her expedient ways to do it. it rained harder in night, so blessing. God, i missing my girls, my second baby son with Masheng, my Crowned Queen from Japan. bring me closer to my new life! help baby's mom, emakingir, refining her 163 blog&contacts. trying to add custom block to include her tweets but failed. narrowly done. peace&hope in the cool morning.^a rain morning but now stopped. the raining scene rare in northern China: it can rain all days and last a week. i felt fruitful upon last night's works. check the result this morning. now surfing, in God's light. 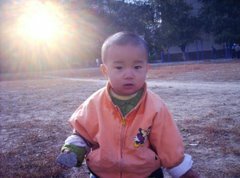 reviewed sin of China nowadays.^treated visiting village kids with games&animation online. restored os against virus infection risk. reviewed the insanity of China all levels authority&even more missing baby son, God of Universe, Hope of China. the sinful neighbor launched to lay cornerstone for their new house, the young wife peeking into my dad's old house for the visiting kids closed door, trying to verify her dark soul in search. really felt the rains plenty, that's what i dreamed after.